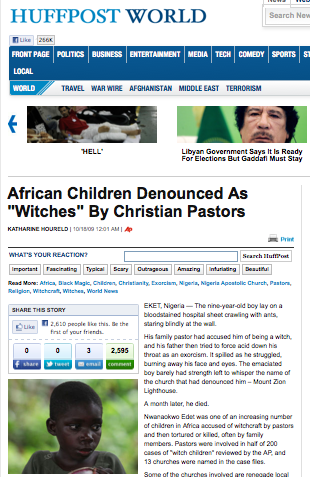 The article (in hyperlink) below shows that Nigerian churches are facing a very serious problem on occultism. Children must not be tortured like this, and suffer from the ignorance, abuse, injustice, discrimination, prejudice, oppression, persecution of their own family church. Parents are also disillusioned to what their pastors have been inculcating in them to believing that their children are indeed possessed or into witchcraft. Many parents are even supporting their pastors' claim, belief and action. To torture and kill a child is unforgivable. The article burdens my heart. Let's pray for these innocent children. Hope this stops. How should these churches and their pastors be punished (and rebuked)? May God enlighten the minds of the pastors and parents in Nigeria and across the globe where this is happening.